This sees Earl Morcar defy King Harald at the crossing point at Fulford. Reading from the left, the panel sees King Harald, prepared for battle displaying his full, commanding stature. Below him, an archer prepares to punish any warrior who lowers his guard. Behind King Harald, his well-equipped housecarls carry his banner, the Landwaster. Below Harald, a group of soldiers advance towards the ford. Their dress and formation indicate that they are different from the other Norse warriors. These weaker soldiers were sent forward to tempt the English to attack. Many of their comrades already lie wounded or dead in the marsh. The opening phase of the battle went well for the English who 'advanced bravely'. Facing the Norsemen is a defiant Earl Morcar. He appears to be lecturing the invaders and defies them to strike him by keeping his shield at his side. He has the courage and confidence of youth. Below him some of his best warriors prepare a hog’s head – an interlocked group of warriors that is designed to drive into the opposing shield wall. The figure at the front of this group appears reluctant but his posture is just pushing back against the thrust of the rest of the formation – This helps keep them together. This was how a shield wall would be broken. Another group of English warriors approaches the battle more tentatively. They are separated from the invaders by the beck and marshy land, so out of range. They are not well equipped and have little armour. However, they do have javelins to hurl and repel any who try to make their way across the mud towards them. These figures are derived from the German woodcut of the workers in the border of panel three. The workers have become warriors. There are some other groups keeping out of range on the land leading down to the river. The boys with slings can inflict little harm but they can force the attackers to keep their shields raised. We have no record of slings being used in these battles but they are shown in the Bayeux. The archers are also an ad hoc group. The Bayeux shows shields bristling with arrows so there is no doubt that they were employed in quantity. The fox motif returns above King Harald. The cunning fox is determined to get the piece of cheese that the bird has stolen. So he tells the bird how beautiful it is. This story is derived from Aesop’s fables and it is incorporated in the margin of the Bayeux Tapestry, although its meaning there is not clear. In this context, the wily fox, Harald, seems to flatter the young Earl by giving him an easy victory. The story concludes in the next panel. There is a copy of a carving of a coiled snake in the same section of the top border. This is another allegory of a dangerous creature that might strike suddenly and without warning. The image of the naked lady being led past houses with closed shutters. This is lady Godiva on her famous ride through Coventry to prevent the imposition of taxes on the local populace. Lady Godiva was the grandmother of the two English earls who were facing the formidable force of King Harald. She was still alive and would live long enough to see the Norman’s conquer the North. This image is derived from a still of the film Lady Godiva, staring Maureen O’Hara. However, the horse has been adapted to the size and shape of the time. The next image shows hounds hunting and further along a tethered bear. 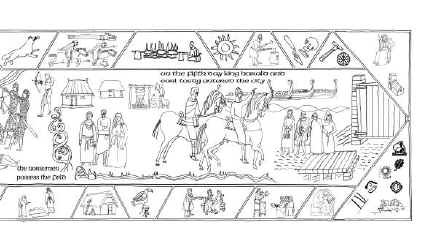 This foretells the events in the next panel where King Harald leads his key troops along the river. These are both derived from the Bayeux Tapestry. The Norsemen form a shieldwall and squat behind their shields so they do not provide a large target for the English archers and javelin throwers. The shields in the Bayeux Tapestry show that both sides used archery and javelins in the early stages of the battle. The wounded from the initial advance at the ford lie wounded by javelin and arrows. Further along, a lone archer takes aim at Harald. Fighting was thirsty work and an old woman has seated herself on a stool to provide the warriors with a little refreshment. These images are derived from photos taken of historic re-enactors. The English shieldwall is ready but there is no action on their left flank of the battle. Soon they will be all that is left of the English formation when King Harald breaks through.